Explore more than 300 touch points as you discover the wonders of our world with this two-sided interactive jumbo puzzle map. 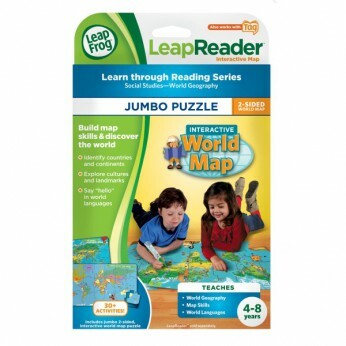 Use the 1 selling LeapReader Reading System to bring this map to life! Meet kid characters from around the world andlearn how to say “”hello”" in their languages. Play 10+ family-friendly games that bring map facts to life! Learn continents, countries and more as you practise map skills. This toy costs approximately £16.99 (for the latest and best prices make sure you check our retailer list for the Tag World Map Puzzle above). In our review of Tag World Map Puzzle we classed it as being suitable for ages 3 years, 4 years, 5 years but recommend you check the manufacturer specific advice before purchasing.